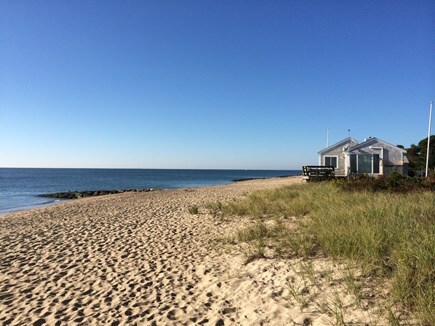 Experience the Ultimate Vacation Down the Cape. 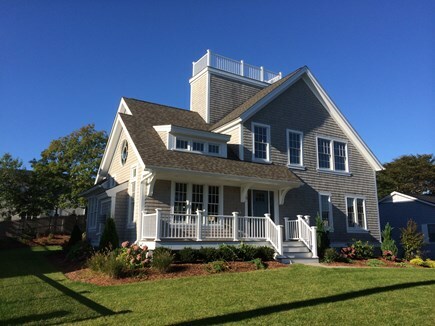 Only steps to private Popponesset Beach, this brand new, charming, Cape home offers beach views from the living room. Just step outside to catch the breathtaking ocean view, or relax in our warm, luxurious beach house with coastal themes. The gas fireplace living room has a 60'' flat screen smart TV. There are 4 bedrooms (two king beds, one twin bunk bed, one full bed with twin trundle bed, and another twin bed) and 3.5 bathrooms. The master bedroom (one king bed) is on the first floor with its own en suite bathroom. The bathroom has a Jacuzzi and separate shower. There is another bedroom (one twin bed) next to a half bathroom on the same floor. Upstairs there are 2 additional bedrooms with their own en suite bathrooms. One bedroom has a king size bed and the other bedroom has one twin bunk beds and full size bed with twin trundle bed. All the bedrooms (except for the bunk bedroom) each has its own TV. Luxurious premium quality beds topped with soft linens will add to your relaxation and fun. The house has central air and parking spaces that accommodates 4-5 cars. Come back after a leisurely day at the beach and enjoy an evening barbecue on our back patio. There is a washer and dryer, and wireless internet is included. Additional pricing info: Cleaning fee of $180, State and local taxes of 12.45% will apply.